(First Edition, Signed Bookplate) During his time at The New Yorker, former Random House editor-in-chief Daniel Menaker happened across a printed mistake: "The zebras were grazing on the African svelte." He was fascinated by the unintentional meaning revealed, and began to see that such gaffes—neither typos nor auto-corrects—are sometimes more interesting than their allusive counterparts. 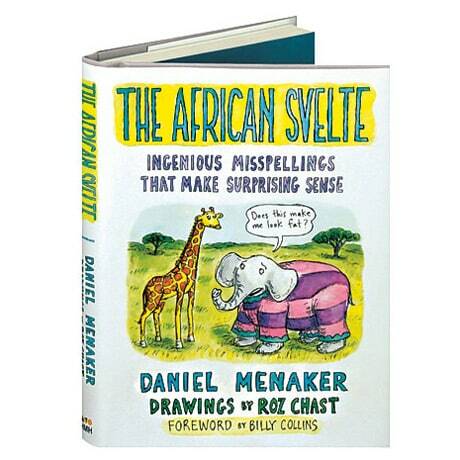 Hilariously illustrated by cartoonist Roz Chast, Menaker's collection of 101 printed examples ponders how language is used, what it means, and what fun it can be. From the gecko, readers will likely find themselves turning the pages with baited breath to discover fool hearty faux pas, and may well laugh off their dairy airs. This first edition includes bookplates signed by both Menaker and Chast.